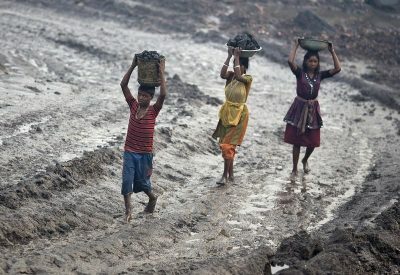 Indian officials appealed to local traders on Tuesday to stop buying mica mined by child workers, as the government comes under pressure from activists to clamp down on child labour. Thousands of children risk their lives working for a pittance in India’s crumbling mica mines, extracting the sparkly mineral used in lipsticks and eye-shadow as well as electronics. Officials from the National Commission for Protection of Child Rights (NCPCR) visited the eastern state of Jharkhand this month to assess the extent of child labour in its mica mines. The state, along with Bihar state, produces about three-quarters of the mica mined in India. “Many of these mines are illegal and they hire child workers to keep costs down. But legal or not, no one should be engaging child workers – it is against the law,” said Yashwant Jain, a member of NCPCR, who visited Jharkhand. “We met with some traders and told them not to buy mica from child workers. We told them we would take strict action against anyone caught doing so,” he stated. Thousands of children climb down narrow mine shafts with no safety equipment, and cut mica with hammers and chisels for up to eight hours a day, activists say. The work puts children at risk of skin disease, respiratory infections, injury and death. The International Labour Organization estimates there are 5.7 million child workers in India aged five to 17, out of 168 million globally. Up to 20,000 children may be working in the mica mines in Jharkhand and Bihar, according to some estimates. The current law bans children under 14 from working in only 18 hazardous occupations and 65 processes including mining, gem cutting and cement manufacture. India wants to amend the three-decade-old law to outlaw child labour in all sectors. But children who help in family businesses will be permitted to work outside school hours, a loophole that activists say may be exploited by unscrupulous employers. The mica from illegal mines is sold to traders or intermediaries, who sell it to exporters, who in turn sell it to manufacturers of cosmetics, chemicals and electronics. Few have systems to check the use of child labour, activists say. Indian Nobel Laureate and child rights activist Kailash Satyarthi has said big corporations must do more to clean up their supply chains and ensure that no child labour is involved in the products they manufacture. Jain said it would not be fair to target the children’s families, who are usually poor and illiterate. “We realise it is poverty that is driving these villagers to send their children to the mines, not to schools,” he said.